USAID Associate Administrator Mark Feierstein made an important announcement about the United State’s ongoing commitment to getting to zero new Ebola cases, during the star-studded Global Citizen 2015 Earth Day Concert on the National Mall in Washington, D.C. Speaking before hundreds of thousands of concertgoers, Feierstein announced the Agency will provide $126 million to Liberia, Sierra Leone and Guinea to re-establish and strengthen their health systems, which have been weakened by this protracted public health crisis. Thanks to the American people, that money will go to both restoring critical health services that shut down during the Ebola outbreak and rebuilding those health systems so a crisis of this magnitude never happens again. To this end, help must extend beyond simply getting treatment to people who have fallen ill with Ebola. Preventing the virus from spreading, and educating communities about the disease are now the primary focus. Field hospitals and portable shelters are integral parts of programs created to deliver medical care and supplies during an emergency event. 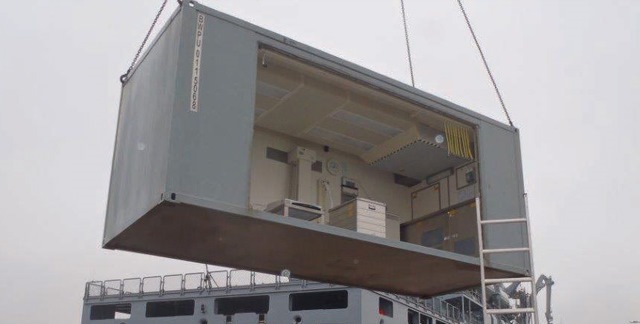 Containerized hospitals and clinics are frequently used as permanent solutions to the need of medical attention in remote areas. Cost effective and durability are the main points that makes a containerized clinic an attractive and in some case, the only option. ALEPH GROUP INC. - Riverside- California.